Rustic stone well renovated and functional with private spaces outside. Nestled in the green hills of Lucca, perfect for a wonderful holiday in the silence of nature, breathtaking views of the valley that will give you maximum relax and unforgettable memories. 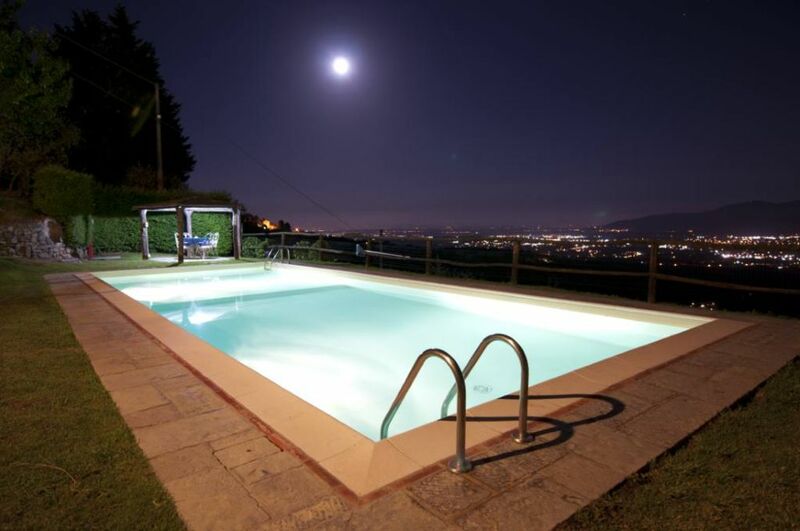 In the green hills of Lucca you can enjoy a wonderful holiday, immersed in the silence of nature with a breathtaking view of the valley, you will give you the ultimate relaxation and unforgettable memories. - "IL FIENILE" house with five beds, furnished in Tuscany peasant style: at the groundfloor a wide stay with fireplace, sofa, seat and chairs; at the half floor one kitchen well furnished with table and chairs and completes of all the equipments (fire, frigo, dishwasher, table and pottery); at the first floor, one double bedroom with adjacent bath-shower; at Mansarda floor, one wide room to tyree single beds and bath-shower. - The double bedroom is fitted with a ceiling mounted fan, whilst the other bedroom which sleeps three is fitted with an air conditioning unit - Air conditioning is charged according comsuption per kw. "IL FORNO" house for four people at ground floor, furnished in Tuscany peasant style: stay equipped from table and chairs and small sofa; kitchen complete of all the equipments (fires, frigo, dishwasher, table and pottery); One double bedroom, one room with two single beds; bath-shower, dishwasher, external washing-machine, vacuum cleaner, satellite TV and central heating. On request it is possible to add a child-bed.Outsidegarden with deckchair and beach umbrella, bower for the lunch in open air. - The house has a Barbecue, dishwasher, washing-machine, vacuum cleaner, satellite TV, heating and parking. The double bedroom in 'Il Forno' is fitted with a ceiling mounted fan and the living room reception area has air conditioning which in fact provides cooling to the entire house - Air conditioning is charged according comsuption per kw. I work part time in insurance, I really like being with friends and I love cats and all animals. I am always happy surrounded by so many friends and I love to travel a lot, I try to have great attention to my guests for helping their every need. If your planes late and you have to arrive after dark it’s rough. Bring food. You will not want to drive back to town at night the Driveway is hidden, narrow, steep, rough, hairpin turns and not marked. Views are beautiful. Clean. Bring cork screw. They offer wine but cork screws don’t work. fully stocked dishes. Bring water. Pool beautiful. Their driveway is behind a brick wall with fountain. We have been working and hosting both foreign and Italian visitors to our properties for over 20 years, so we were rather surprised to read your review. We have never before had any complaint or issue regarding the location of the properties or indeed the driveway. Yes, if you were expecting to be in town you clearly came to the wrong place! We are, as is obvious from our website, located in the hills surrounding Lucca, therefore the roads are rather steep and winding wherever you go-it's Tuscany! Maybe you're not so used to traveling! Despite contacting you several days before your arrival to find out the approximate time you anticipated being with us, we only heard from you at 7.30pm on the day that you would be arriving the same evening at 9.30pm. You did arrive late which was inconvenient for you and for us. We normally have a check in time between 4- 7 pm but of course we do our utmost to accommodate our clients. It is always disorientating arriving tired and stressed from a long journey, but as I mentioned there are 3 very good restaurants in close proximity. There are also good food shops nearby but as you arrived late the shops were sadly closed. I'm sorry that our gift to you of a bottle of wine caused so much distress, it was left with good intention. I'm sorry you had difficulty opening the wine, there are 3 cork screws in the house, in the kitchen draw, which unfortunately you did not find, although I had told you and showed. We hope you enjoyed the rest of your holiday. Our party of four stayed for a week and loved EVERY MINUTE! The house is exactly as described/pictured and just oozes charm. The kitchen was well stocked and we cooked many delightful meals and dined "al fresco." We enjoyed the cool, salt water pool every afternoon after warm days of sightseeing. Marina was wonderful to deal with; always promply replying to any questions we had. After the hubbub of Rome, "il fienele" was a peaceful oasis high above the hills of Lucca. Thank you Karyn for the nice comment, I'm happy you had a nice time and I hope to meet you again! Family of 4 (mom dad & 2 teens) stayed for 8 nights in August 2018. From the very first email, Marina was very easy to communicate with and was always very accommodating. We have stayed in many places around the world and this was definitely one of the easiest to book. We stayed in Il Fienile, a 2 bed/2bath Villa (1 queen bed & 3 singles). Pictures are very accurate and the Villa was as described. There was lots of privacy and the only time we saw other guests (from the 2nd smaller Villa) was only occasionally at the pool. Ah, the pool...a welcome refuge after a day of sightseeing. The view of Lucca and beyond was beautiful! Lucca is about a 15 minute drive away (one way), Pisa about 30 minutes, Florence about an hour and the Cinque Terre about 1.5 hours away. We attended Paolo’s cooking school/dinner (75Euro each) and thoroughly enjoyed the class as well as our dinner afterwards - so good and highly recommend doing it! Marina and Paolo were delightful hosts and very willing to provide recommendations on sights to see and places for dinner. (Highly recommend having dinner 1 night at Osteria da Giomo 25Euro/person. No menu, they provide every course - so good and so much food!). Overall, our stay was wonderful and after checking out so many places before booking this Villa, I’m glad we booked this place...and Marina and Paolo were delightful xo! Thank you Rebecca for the nice comment, to meet you and to spend time with you and your wanderful family has been really a plesure, we hope to meet you again! A lovely villa with breath-taking views. We were made most welcome by Marina and Paolo. This is an excellent base from which to explore the town of Lucca and the local Tuscan countryside. Thoroughly recommend. Thank you Jill, to host you and your nice family has been really a plesure for us, remember, we wait for you!!!! A very pleasant accommodation for the relaxing holiday. Lovely view. In such place you may have totally best vacation. We had a great week with our two small children. The house is beautiful in a great location with amazing views over the valley. The pool is great as well. The location is very convenient for Lucca and Pisa. Marina and Paolo are very friendly and were extremely helpful at helping us find restaurants to visit as well. (Text automatically translated) From Lucca take the ss. Brenner direction "Abetone", after a few kilometers (5/6), turn right at the sign Matraia - Climb the hill for 4/5 km remaining always on the Via di Matraia - Pass the village church then look for the number 85 on the left . (Text automatically translated) Nearby there are numerous historical and ancient villas important art cities (Florence, Lucca 15 minutes-1 hour, Pisa 40 minutes) - The area of ? ?Garfagnana - Wine and food - The thermal baths of Montecatini - The Pinocchio park in Collodi - The sea of Versilia - Biking - Restaurants serving local cuisine, and even small towns and villages to the mountains of the Pizzorne suitable for practice jogging and mountain biking (mt.900 height) - "The wine road" the hills surrounding Lucca and Monte Carlo, "along which open cellars and farms where you can buy wine and other products.